The RTC Board of Directors adopted the 2019 update to the Regional Transportation Plan for Clark County at the Board’s March 5, 2019 meeting (Resolution 03-19-04) concluding an RTP update process that was initiated in April 2017. During the update process, technical review and input was provided by the RTAC and policy review provided by the RTC Board of Directors at the Board’s monthly meetings. The RTP update was developed in coordination with jurisdictions, agencies, and the public in order to develop regional solutions to transportation needs. Throughout the 2019 RTP update process, there were many and varied opportunities for public participation. Monthly meetings of the RTC Board of Directors allowed the public to comment on regional transportation issues in a formal setting. All comments at these meetings became part of the meeting record. The RTP update was a regular agenda item at RTC Board meetings held from April 2017 through to adoption in March 2019. RTP information and RTC Board materials relating to the RTP were made available through this website. The public was also able to provide RTP comments to RTC via e-mail, phone or mail. 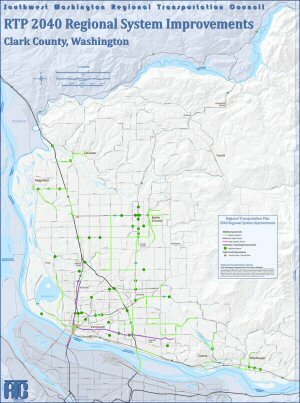 Public participation opportunities also included an open house on September 10, 2018, held in conjunction with an open house seeking input on the Washington Transportation Plan. Public participation in regional transportation planning builds from local efforts. More localized public participation efforts included transportation meetings hosted by C-TRAN, by WSDOT and by local jurisdictions. RTC staff sent regular updates on the RTP’s development to Clark County and Vancouver neighborhood coordinators and kept small cities informed through their RTAC representatives. Under current federal law, the RTP must undergo periodic review and be updated at least once every five years. The 2019 RTP update replaced the 2014 edition. The 2019 RTP Update is available for download in the sidebar. The Plan contains chapters 1 through 6 and 13 appendices as outlined below. The RTP is introduced and its vision, goals, framework and statutory authority outlined. Clark County’s demographic data, development trends and regional development strategy are discussed. Existing and future land uses and development patterns are identified. 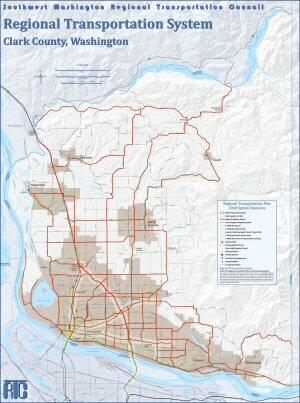 The regional transportation system is designated and defined and regional transportation system performance data provided. Regional transportation system performance is considered, levels of service discussed and transportation system capacity analyzed. Financial assumptions are stated, potential revenue sources are identified and a plan for financing transportation system improvements is presented. Development of a balanced transportation system is considered with descriptions of transportation programs and modes provided. Recommendations for development of the regional transportation system are made. Performance monitoring measures, provisions for involvement of the public in development of the RTP are described and for implementation of regional transportation goals, policies and actions established by the RTP are described. The RTP review and amendment process is outlined, should changing policies, financial conditions or growth patterns warrant amendment of the Plan.